Are you searching for Faculty Teachers Punjab 2019 or FacultyON Punjab 2019? 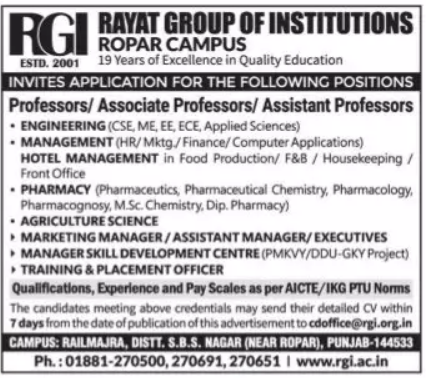 A college based in Punjab named Rayat Group of Institutions, Punjabe has advertised in the TRIBUNE newspaper for recruitment of Professor / Associate Professor / Assistant Professor Plus Non-Faculty jobs vacancies. Interested and eligible job aspirants are requested to apply within 07 days from 30th January 2019. Check out further more details below. About College : Rayat Engineering Institute at Ropar (Punjab) was founded by two young visionaries ñ Nirmal Singh Rayat and Gurvinder Singh Bahra to prepare young engineering graduates for the job market. As per AICTE / IKG PTU norms.